Chicories and Endives are a closely related group of leafy vegetables that exhibit a variety of sizes, shapes, colors and textures and all have in common a particular flavor that ranges from mild to overly bitter. The group includes Belgian, Red and Curly Endive, Escarole, Frisee, Dandelion Greens and several varieties of Radicchio. There remains a bit of confusion when identifying these vegetables as France, England, Italy and eventually, the United States have used different names to describe particular members of the group. For example, what is known as Chicory in England is Endive in France and Belgian Endive in America and Italy uses Radicchio to describe several different types of Chicory. We will use the American terms to describe these vegetables and leave it to you to figure it out when traveling abroad. Though available year round, Chicories and Endives are considered cool weather crops and flourish at this time of year. These vegetables, with the possible exception of Curly Endive (the most bitter), are quite versatile and may be used in any manner of culinary techniques. Some varieties-especially Belgian Endive, Radicchio and Escarole are excellent in salads and have a sturdy texture that makes them suitable for both braising and grilling. Escarole is another leafy type of Endive, with larger ruffled leaves and an open head. Frisee is a smaller, lighter version of curly endive. A blanching process is used to shield light from the young plant that results in delicate, slender curly leaves that range in color from ivory to apple-green. A curly chicory variety that looks like a cross between frisee and endive with a slightly bitter, nutty, sweet flavor. Dandelions are edible in their wild and cultivated forms; they're bitter, though not ferociously so, with jagged, "lions tooth" like leaves. 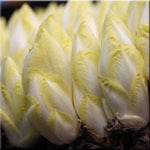 Belgian Endive has an ivory-white head with pale yellow-edged, closely wrapped leaves, a mildly bitter flavor and tender juicy texture. 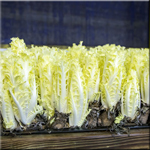 Curly Endive grows in bunches of long, deep green curly edged leaves with thin white ribs. 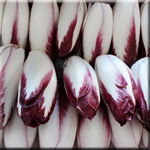 Red Endive is a cross between white endive and Treviso with closely wrapped leaves, a mildly bitter flavor and tender juicy texture.